Fits all seasons. You can wear this beautiful beanie any season: Spring, Summer, Fall and even Winter is you are lucky to live in a warm climate. This hat is a great hair accessory to make you look different every day. You can wear it outside as well as inside the building all year long. Suitable for any age of women. Comfortable, soft, no-slip, easy to wear, fashion fascinating beanie hat cap cloche. This beanie can be also considered as a theatrical play props for women or just as a party hat clothing. Stretches to fit most head sizes. If you have average size head, which is 95%, this nice art yoga cloche will fit you perfectly. Fits 21.5 - 23.5 inches circumference. It is soft, it stretches and it is a cable knitted lace beanie. This beautiful light weight cotton lace hat can be a wonderful gift for her as it fits adult women and girls 10+ as they have the same head circumference. This boho hat is also very light and compact, and it can be easily put into a small ladies handbag. Hats & Caps. Suitable for any style of clothes. You can just wear this lace cotton cap casually indoors or outdoors. 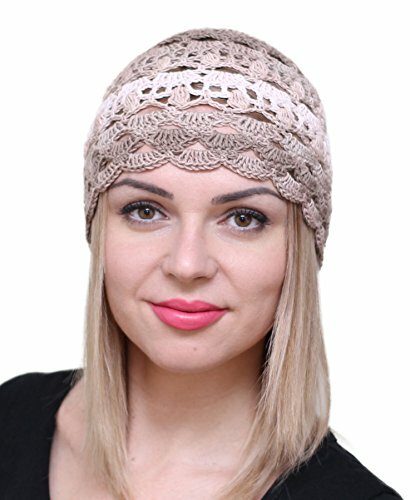 Beautiful lace beanie can be a perfect hair accessory for the yoga fans both women and girls. It helps to dive deeper into the image in the meditation prosess. This nice women's light beanie hat is perfect if you want to make a theatrical image in some kind of theatrical performance. You can wear such a crochet women cloche hat just to look different every day. It's great for a nice sunny day. If you have any questions about this product by NFB, contact us by completing and submitting the form below. If you are looking for a specif part number, please include it with your message.